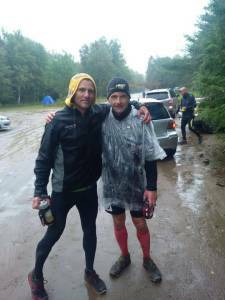 Peter Taylor with the yellow hood and Nick Brindisi with the red socks and plastic at the finish! The weather on Friday night was picture perfect for running. We pitched our tents taking care to kick the horse poop out of the way. It’s like a tradition and it’s bad luck to not play a little horse soccer. It was like visiting my long lost tribe. Those amazing people who run a really long way in the forest in all conditions, their support crews, volunteers and everyone who makes this experience so awesome! 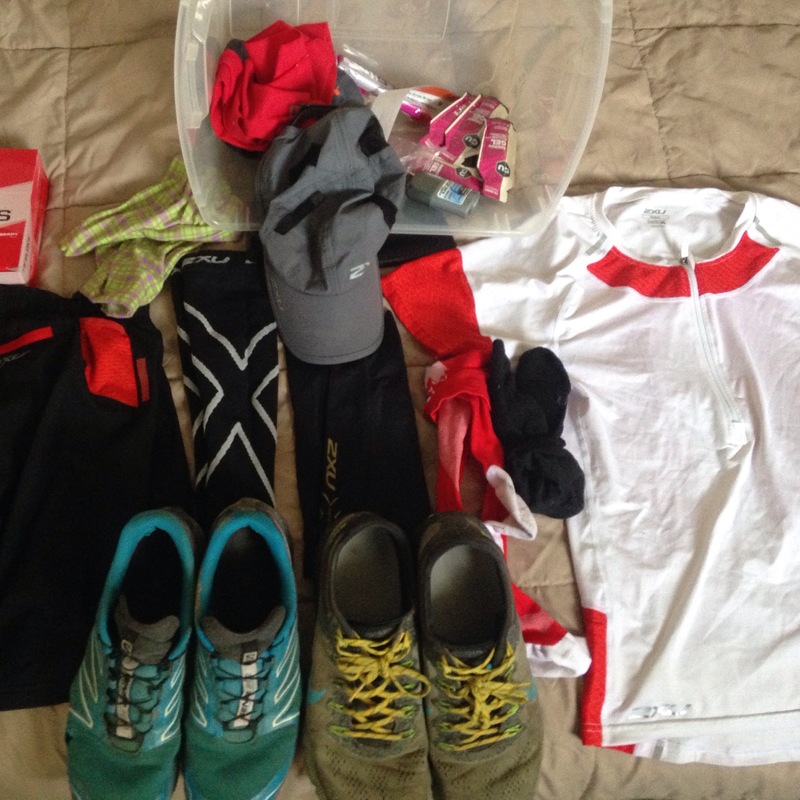 Planning and bringing everything you might need is important. We hung around having a little beer and some food to pre-load our carbs in a way that would not cause any gastric distress. Old stories were brought out and newer ones too! Lots of laughs and shared experiences came out. Despite a poor nights sleep in tent I was stoked. The tent city at any trail race is like sleeping in a field of water buffalo with the snoring, farting and then the wolves joined in! I just meditated and let all the thoughts about the race go out of my head until sleep came. When it came time for my iPhone to wake me up with my usual & appropriate “Shock the Monkey” by Peter Gabriel I was already awake. I had planned for 24 hours or less and ran the first 80k in 11:30 which was 23 minutes slower than I did 80k there last year. 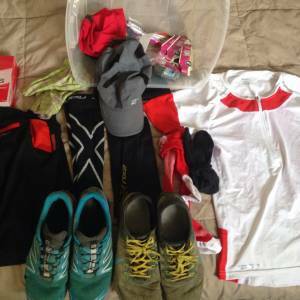 You want to go out slower in one of these 100 milers. Plan A was so far so good. Nutrition was right on, hydration was perfect and my feet and legs felt really amazing considering. After the turn-around Peter Taylor gave me some nutritional potions to take on the 2nd lap and helped change my socks to my 2XU Canadian flag compression socks. I needed & appreciated their support for the 2nd 50 mile lap. My muddy shoes and the best belt buckle I own! All hell broke loose at 120 km at aid station 7 with 40 km left to go. The torrential monsoon had begun. It rained consistently from 1am till finishing noon on Sunday. The trail became a soupy mess with ankle deep mud in places, slick mud on rocks and water flowing over the trails. Because I was tensing my legs a lot in trying to maintain balance on this course, my hip tightened up so painfully that I could hardly push off on the left side. There is nothing more disheartening than running alone in the dark up and down the Hali hills by headlamp tripping over rocks and roots getting poured on. I was really at a low by 3am when I realized that there was no way I could keep up any meaningful pace with my hip and with the hockey rink like traction on the trails. Also I began sleep running. This was quite an odd experience. It’s something Dean Karnazes had talked to me about back in July when he was telling me about his Badwater experience. Basically I nodded off and woke up with a gasp quite a few times realizing I was still running and that I was almost off the trail. Another runner came up behind me and asked if I was ok. He helped remind me that a couple of gels might help with their caffeine. I had a couple of them and continued on feeling miserable but awake. Keeping core temperature up is key to this whole process and the plastic rain poncho kept me dry and with the layers underneath I was warm. Kept eating 250 calories an hour with some of the amazing fare from the 7 aid stations on the course. Everything from home made soup to burritos, potatoes with sea salt, every kind of drink concoction etc. My feet after the 100 mile punishment. The nurse did a great job of draining my blisters by syringe! So this horrific last 40 km extended my 2nd 80k lap and now I was flirting with the 30 hour time limit with my excruciating hip and slipping all over the hills on mud. I got to the last 10k lap of the lake and was told I had just over 2 hours to meet cutoff. That loop is gnarly but I told myself pain is temporary but failure is forever. I ignored the pain and pushed anyway. I came around the lake and had just 8.5 minutes to run up the hill to the finish 2.5k away. That’s a tall order “sprinting” after 157.5 km but I tried my best. I arrived 4 minutes late, but race director Helen Malmberg gave me the buckle anyway perhaps because of the inhuman conditions or because nobody usually sprints at the end of these things. So much thanks to Peter Taylor for crewing second to none. Thanks Marc Pelosse for throwing down a crazy fast 100 mile good enough to win the race before the monsoon started and for also being so supportive. So nice to see Andrea Moritz bringing her positively and support to us for this event. Thanks to my sponsor 2XU and the 2XU XTRM team whose running wear and compression garments are 2nd to none. Thanks to Helen Malmberg the race director, Don Kuzenko, the guy who is so good at aiding runners in so many ways that it feels like coming into port after a night on stormy seas and all other volunteers! Thanks to the nursing staff who drained my blisters. 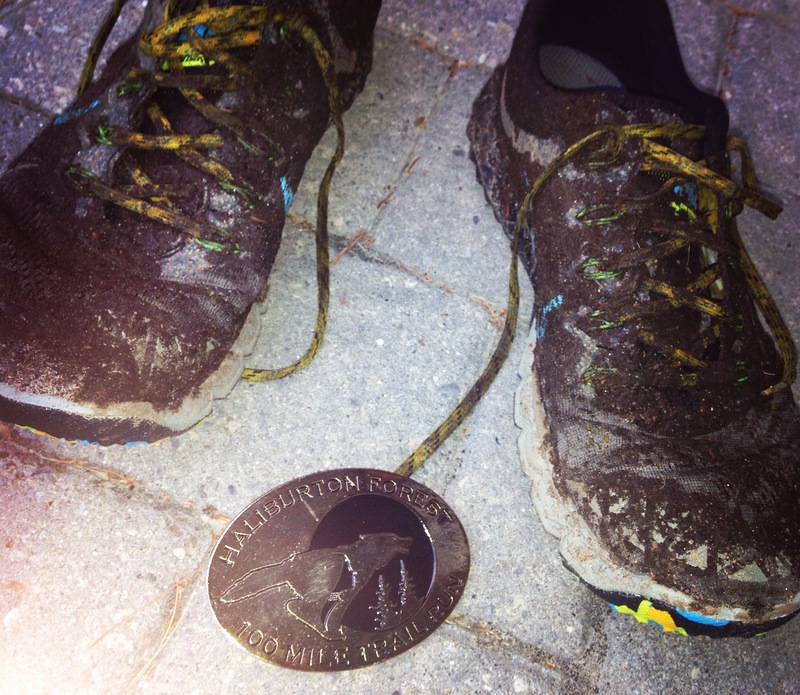 I’ll be back next year to run the Haliburton Forest again. 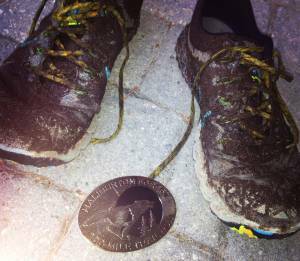 Having run the 50 mile and the 25K there in previous years I had no idea how completely engrossing the 100 could be. It may lack the huge rocky mountains of races like Sinister 7 but it makes up for it with never ending smaller sized hills. It seems like you are always climbing and descending. There are always muddy bogs, rocks, roots and very technical running, but without the pouring rain I know I’ll be faster next year! I can’t wait. 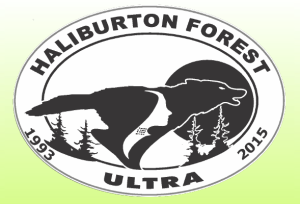 Share the post "Haliburton Forest 100 Mile Trail Race"